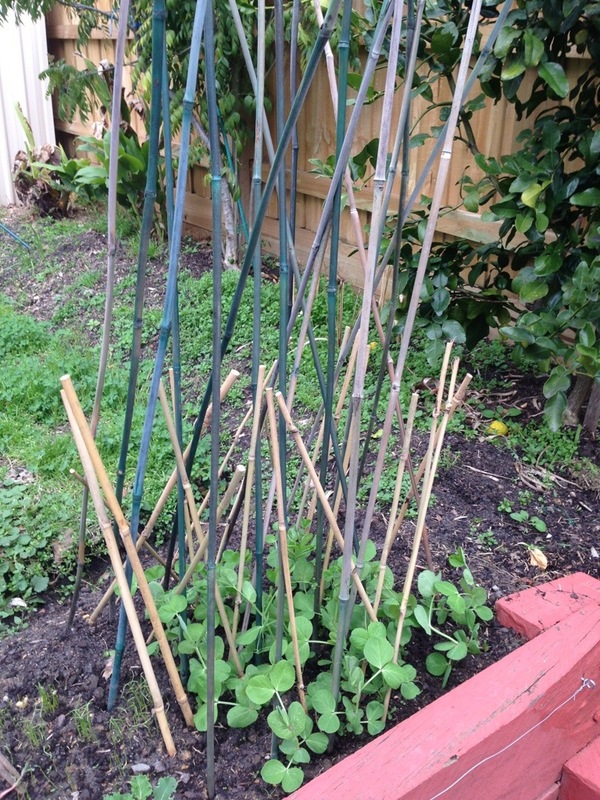 This haphazardly looking bamboo arrangement is in fact a climbing trellis for our snow peas. I saw something like this in a friend’s garden and had to give it a try – especially since there was no skill involved in making it. The idea is that you arrange all your spare bamboo stakes in a criss-cross fashion above your developing shoots. As the shoots grow, the tendrils intertwine around the bamboo and when they do so around the points where the individual stakes meet, they lock both stakes in place. Because each stake meets a different one at different points up the trellis, the continued growth of the peas creates a firm structure. The aim is to get a snow pea hedge when the shoots are mature, saving space and providing some fun in looking for snow peas in the busy snow pea hedge. A good thing about doing it this way is that in the end there are no garden ties to fiddle with when the legumes are all dried, hard and tangled at the end of summer.